(Honolulu, HI; 1-13-18) A young mother tearfully clutches her newborn as her defenseless military officer husband hugs the two for a final prayer. Panicked drivers speed by Queens Hospital. One runs a red light nearly striking a truck. A young man, in a dazed state of remorse, calls his parents to declare his love and thankfulness with only minutes to live. An elderly patient with a heart condition and high blood pressure suffers angina and faints. Students and faculty at the University of Hawaii flee for their lives. Across town as a hotel security officer calmly walks to the hot pool. He asks two vacationers to vacate in lieu of the “INCOMING” nuclear bomb. They both broke down in tears before dripping back to their rooms. Such is the imposition and deprivation of First Amendment rights from the Hawaii ballistic missile threat of Saturday, January 13, 2018. Hawaii Ballistic Missile Threat alert that appeared on cell phones at 8:07AM on 1-13-18. 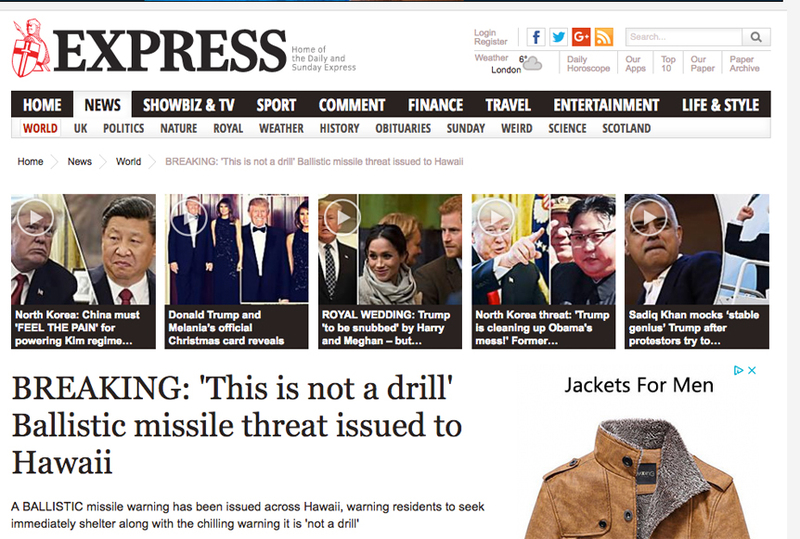 These public reactions to the “BALLISTIC MISSILE THREAT INBOUND TO HAWAII” evidence a world engulfed in cyber-warfare, “fake news,” and overall madness. It is totally unreasonable and unconscionable that society would permit two alleged mad men on two sides of the Pacific to threaten the world with nuclear Armageddon. You would need to be a total criminal psychopath to aid-and-abet in any way this crisis, or exonerate its perpetrators. The Hawaii ballistic missile threat emergency alert was broadcast at 8:07 a.m., and not corrected as a “False Alarm” until 8:46. I reported this fact on KWAI 1080AM in Honolulu at 9:10AM that morning. 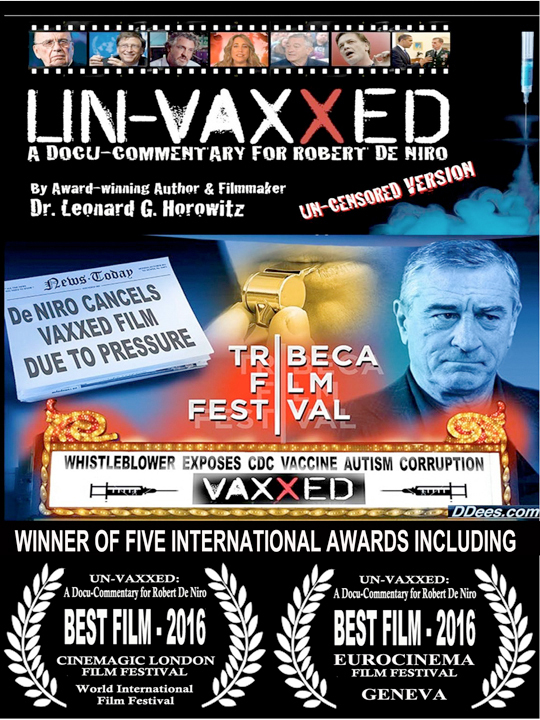 Dr. Horowitz and I were preparing for the studio interview at the time the so-called “mistake” happened. Enroute to the station we called authorities to no avail. Civil defense officials were clueless and swamped with calls. Was it a hacker? Was it someone accessing the system through the CIA’s headquarters in Langley? Did Booz Allen Hamilton serving National Security in Honolulu broadcast the warning? Or was it Homeland Security messing-up a test? State and federal officials claimed ignorance long after the 38 (some say 39) minutes of sheer panic that continued to damage citizens in Hawaii hours later. “Can I come out of my bunker now?” asked a cell-phone caller to the station minutes after The Source Naturals Radio Show began, at 9:10. “Yes. I do believe you are safe now,” Bob, the engineer kindly advised the distressed listener. Curiously, The Source Naturals Radio Show hosted by Damian and Karen Paul, and sponsored by their store in Kailua, HI (where Past-President Obama vacations), scheduled us for the broadcast month ago. 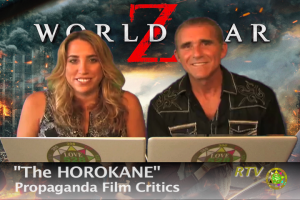 Dubbed “The HOROKANE” for our controversial celebrity, we planned to discuss The Las Vegas Deep State Massacre. 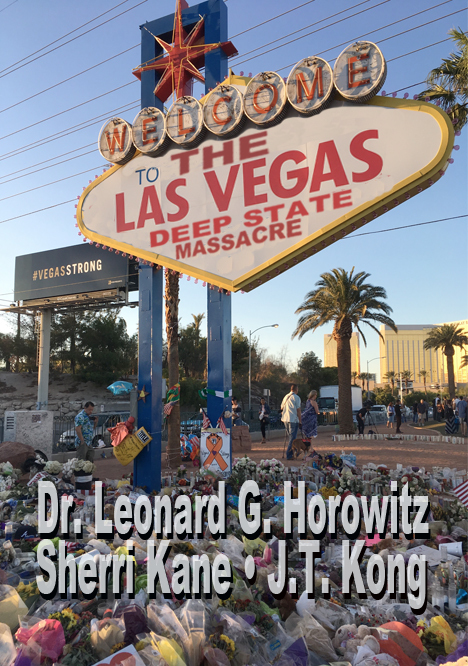 Fresh from our three month investigation of that terrifying tragedy on October 1, 2017, Dr. Horowitz, an award-winning author, filmmaker, and world leading independent intelligence industry analyst provided most of the unprecedented discussion on the show. Hawaii citizens were freaking out during the crisis, and distressed callers phoned in for emotional support and explanations. 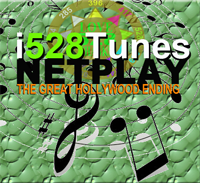 Click this image or the link below to play the radio show archive. “Incredibly, officials said the employee who made the mistake wasn’t aware of it until mobile phones in the command center began displaying the alert.” That is, seconds after the idiot supposedly pushed the wrong button. 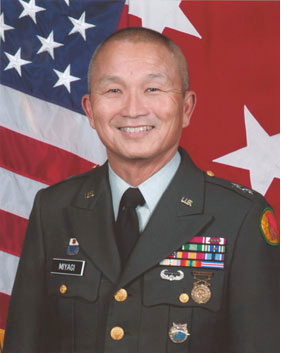 With all the millions of dollars spent on this emergency response system, it is unreasonable to claim some unidentified fool, as U.S. Army Retired Maj. General, Vern Miyagi, claimed, could not have cancelled the alert and corrected the message faster than two-thirds of an hour later. Incredibly, Miyagi admitted during a press conference that he was home, got the alert on his cell phone, and immediately thought it was just a false alarm. He advised the public to keep tabs on what political tensions might be happening in order to know if any alarm the government issues is either false or real, if it ever happens again!*?!*? Miyagi could not explain why the existing two step verification procedure already in place did not work. Nor did he know why it was that some loud alarms went off in some communities, but others not. “They are separate systems,” he admitted. And that admission gives cause to realize a coordinated covert operation was being administered by a powerful federal agency beyond Miyagi’s knowledge. Otherwise, it would not make sense that Miyagi was home, knew the alarm was false immediately, but others in his organization had to deal with it for 38 minutes without him being at the control center. Compounding this evidence of coordinated Deep State cyber-crime administration, Miyagi also admitted when questioned that certain cell phone companies broadcast the warning while others did not. Only federal intelligence agencies, not a state police and civil defense department, have the power to automatically trigger some wireless companies, but not others, to broadcast phone alerts. We’re supposed to believe that when Miyagi et. al., scripted and programmed the Hawaii’s most important messaging computer to broadcast the alert, they did not think to add the cancellation notice. But that too is inconsistent with the facts reported earlier by officials. The cancellation protocol required FEMA involvement, they initially said. And that is the truth. In fact, the entire state-federal integrated system required licensing from FEMA. FEMA protocol, in fact, must be followed in order to broadcast that warning through cell-phone networks, involving cell-phone companies. 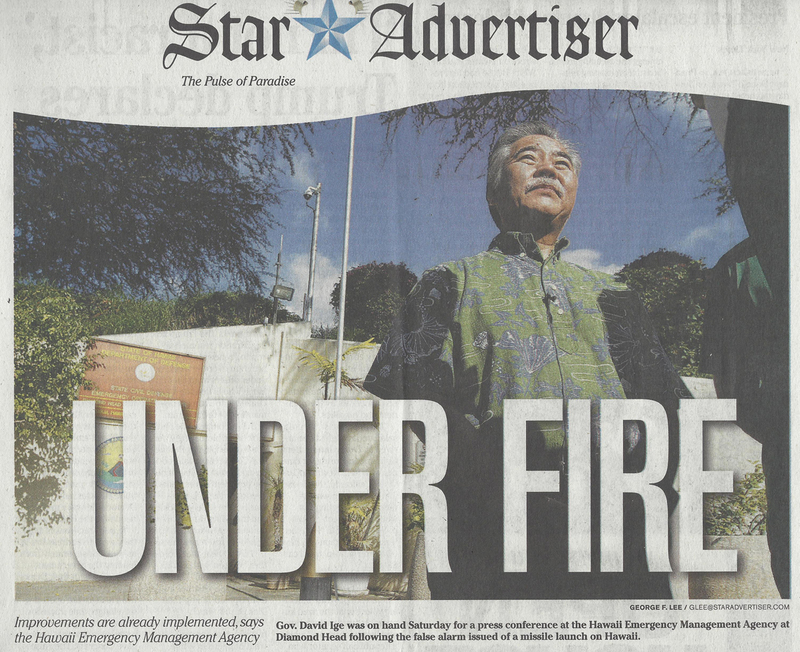 Meanwhile, the criminally negligent act creating tort liability here is being concealed by Governor Ige and Miyagi. 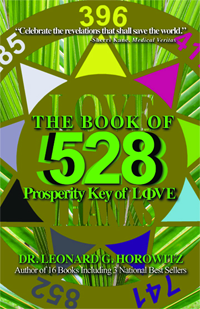 This was first published by the Hawaii Free Press, and confirmed by these authors. During the Saturday afternoon conference, Miyagi stated he and his team were solely accountable and embarrassed. “The Hawaii emergency management officials . . . noted the obvious need for a better way to recall accidental messages,” wrote Issie Lapowsky for WIRED at 6:14 PM. Outrageous! Alternatively, if that “guy” actually was an idiot, it shows the State of Hawaii hires idiots, total incompetents, to push the government’s two most important switches. It shows how dysfunctional our civil defense and governmental security systems are in the wake of a ballistic missile threat. And it shows how taxpayers have been defrauded into believing our security systems are viable. It shows how vulnerable we are to those on government payrolls administering “preparedness” and “defense strategies.” It shows the most advanced technologies and communications systems are susceptible to idiot errors. And it shows we are not protected from ego-maniacs targeting any American city with a nuclear missile. It shows that all nuclear weapons MUST be banned immediately by every nation in accordance with World Beyond War justifications and common sense. The “idiot” had less motive to flip the wrong switch than those in the corporate-controlled media reporting this ridiculous excuse that conceals the obvious PSYOPS. 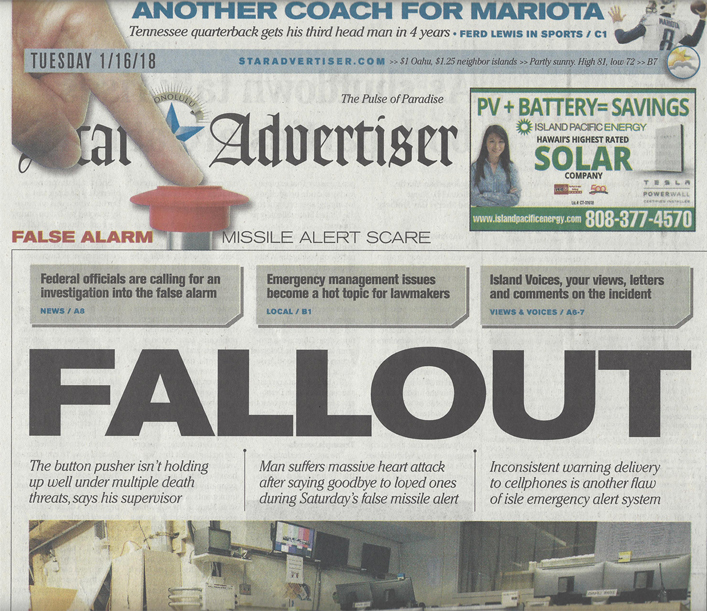 Investigating the Star Advertiser, for example, for clear and present motives for frightening the public so criminally, this most circulated news organization in Hawaii is owned by David Black, previously with the Hearst Corporation. 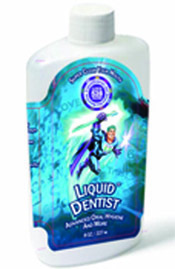 In 2014-15, Black merged assets with Glacier Media Inc. Glacier’s major shareholders include the Bissett group, including Franklin Bissett Microcap A and FaithLife Cdn Small Cap Equity. 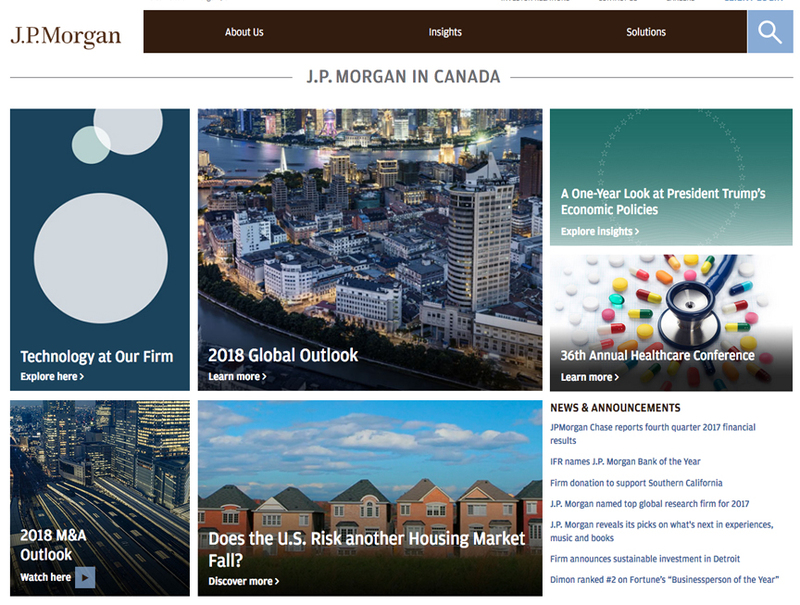 These, in turn, are controlled by J.P. Morgan Bank Canada, a branch of the J.P. Morgan Chase enterprise that is HEAVILY invested in the defense industry. 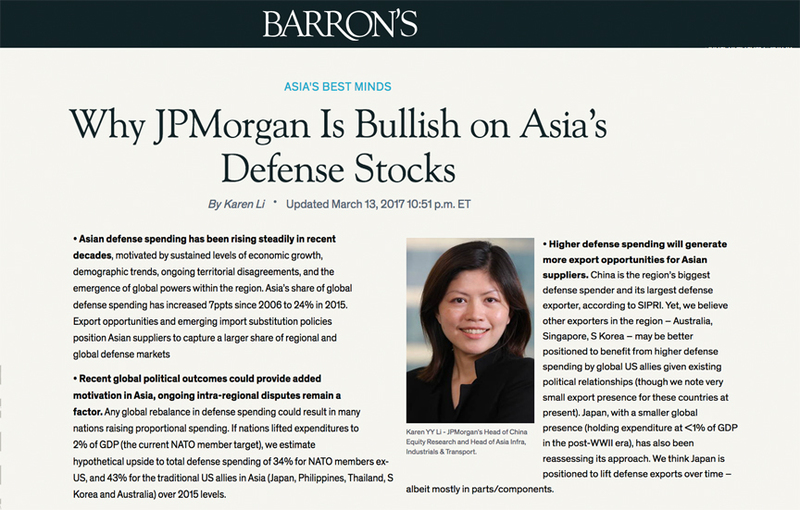 And not only is this concealed conflicting interest disgusting, this criminal enterprise openly advertises the financial benefits to their investors of destabilizing Asian-American relations and generating the “bullish” military markets that will profit stockholders, depending on global and regional disputes inflamed by their media and political puppets, as advertised HERE and in the graphic below. Identifying the political puppets bribed to go along with this “white collar organized crime” and racketeering enterprise is also not hard. The main politicians controlling Hawaii and the citizens here feature Democratic State Senator Roselyn Baker, exposed by Dr. Horowitz and I earlier on JudicialCorruptionNews.com for her $250,000 in payoffs concealed from the Campaign Finance Committee. 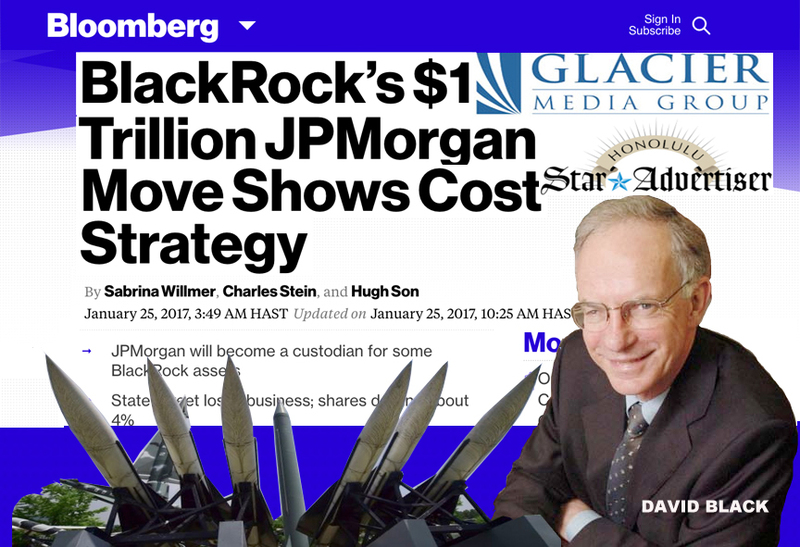 The Blackrock “iShares” bribe came through the state’s leading lobbyists–George A. Morris and John H Radcliff of Capitol Consultants. This matter, that the election committee whitewashed, has been stonewalled by the State’s Ethics Committee since 2015. Today, Hawaiian citizens were forced to confront their death. This was the fruit of the demons’ labor aided-and-abetted by evil obedience. What can and must be done most urgently is a popular peaceful uprising of citizen/consumers ousting the devildoers from office, politics, and commerce. Boycotting complicit companies, such as the Star Advertiser; shunning all the local news media that neglects their public duty and First Amendment license to serve people above multinational corporate sponsors; and exposing as best we can the willfully-blind agents within the FBI and law enforcers who are aiding-and-abetting such blatant organized crime for fear of losing their jobs. These people’s jobs are not as valuable as people’s lives or the further of life on earth. “Follow the money” if you want to discover concealed truths that can set us free. Here, as usual, the wealth flows through a maze of National Security officials and their boardrooms comprised of defense planners and preparedness entrepreneurs. You will find “crisis capitalism” and patented “military neuroscience” applications tested and perfected in this labyrinth of commercial crime. The “public alert system” that uses, and today abused, the most advanced media persuasion technologies did not fail. 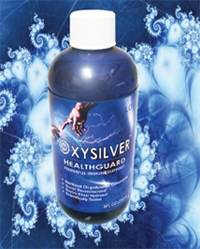 Alternatively, it served brilliantly for 39 terrorizing minutes administering a “PSYOPS-like” experiment. This observation best fits the facts. And with this Hawaii ballistic missile threat we see common links to other terrorizing events. Today’s “drill” extended a pattern of Deep State “drills”–organized criminal “exercises” compounding for years according many experts, including Dr. Horowitz. In the recorded-live broadcast (playable by clicking HERE) Dr. Horowitz compared the Las Vegas and Hawaii frights, including the fact that both events occurred contemporaneously with federal “drills.” The Las Vegas shootings occurred during a Department of Homeland Security “exercise.” This best explained police and citizens’ reports of shootings at hotels other than the Mandalay Bay along the strip. 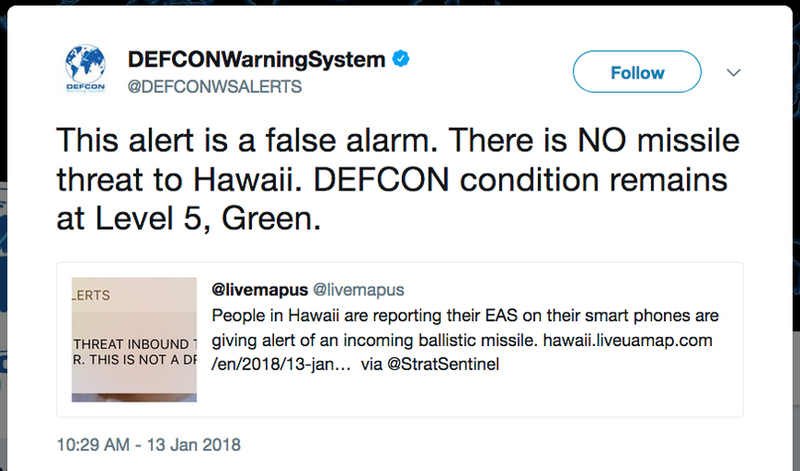 The Hawaii ” BALLISTIC MISSILE THREAT ” happened only three (3) days before the Centers for Disease Control and Prevention (CDC) planned to stage a training session on January 16, titled “Public Health Response to a Nuclear Detonation.”(1) The false alert obviously provided some “real life” data. 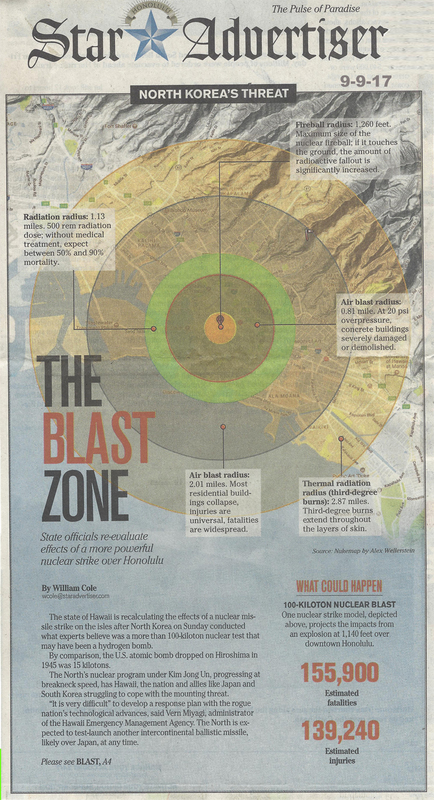 Honolulu Star Advertiser article published four months before the “Hawaii Ballistic Missile Threat” driving calls for massive defense spending. The Hawaii ballistic missile threat gave “military neuroscientists” a perfect opportunity to study this “psychosocial pathology” of evil obedience. In other words, agents applying military neuroscience best explain this one more in a series of Deep State PSYOPS. 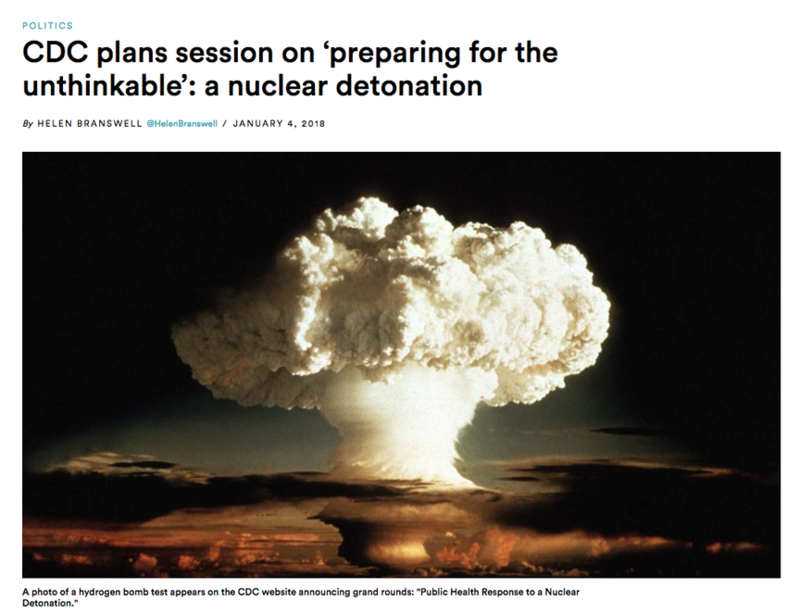 “A spokesperson for the agency said planning for the event ha[d] been underway for months — in fact, since CDC officials took part in a “radiation/nuclear incident exercise” led by the Federal Emergency Management Agency last April, Kathy Harben [of the CDC] said in an email.” Also, curiously, the “Wayback Machine” record of December 31, 2017 was struck, precluding us from identifying the FEMA speaker(s) who had booked their flights to-and-from the conference. 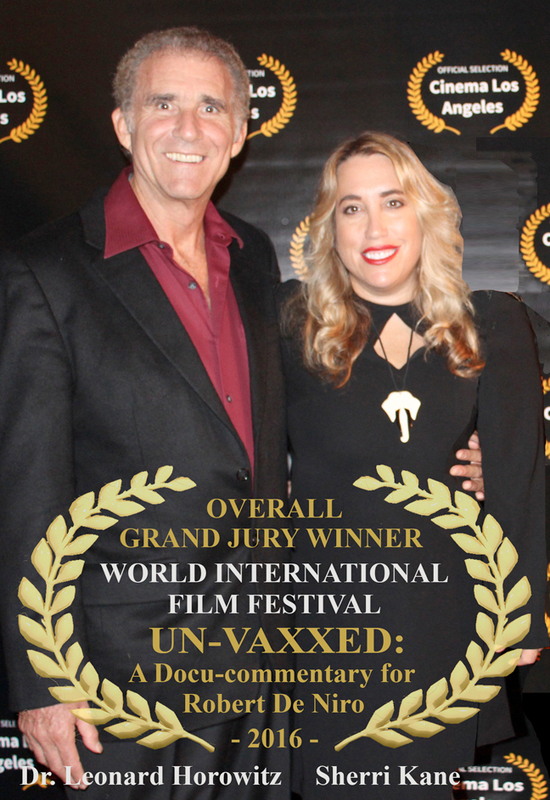 (3) View Sherri Kane’s impromptu interview of Dr. Neppe at a health conference in Hawaii by clicking HERE. (4) See also Space Pearl Harbor e-book by Sherri Kane and Dr. Leonard G. Horowitz for the U.S. Air Force’s “connection” to the Thirty Meter Telescope (“TMT”) falsely claimed to have no connection whatsoever to the U.S. military. 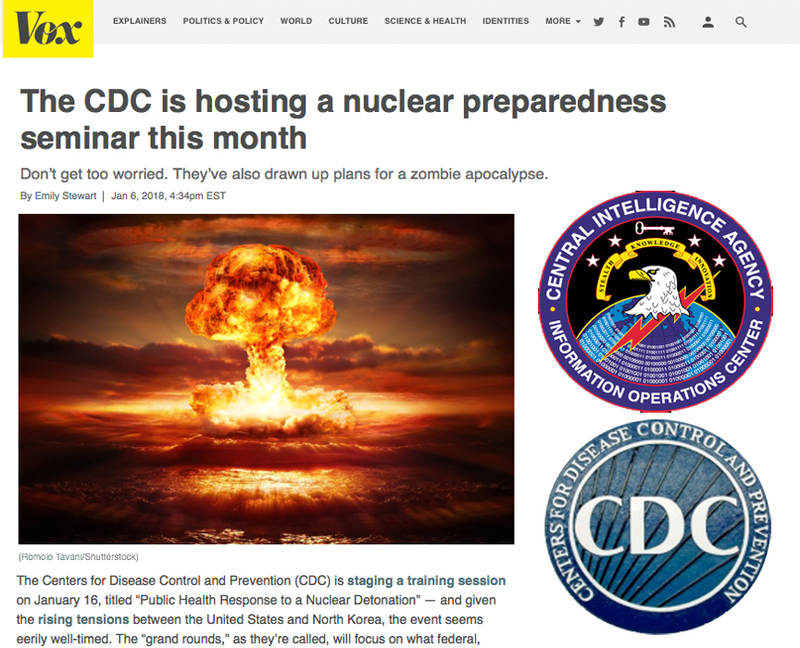 (5) On 1-16-17, the day the CDC was to hold its “nuclear preparedness conference,” Reuters reported a similar nuclear alert “mistake” in Japan. This NHK “mistake,” and the company’s same Deep State institutional investors further evidences a pattern of “drills” best explained by “military neuroscience” and psychological operations (i.e., “PSYOPS”) for social response research. 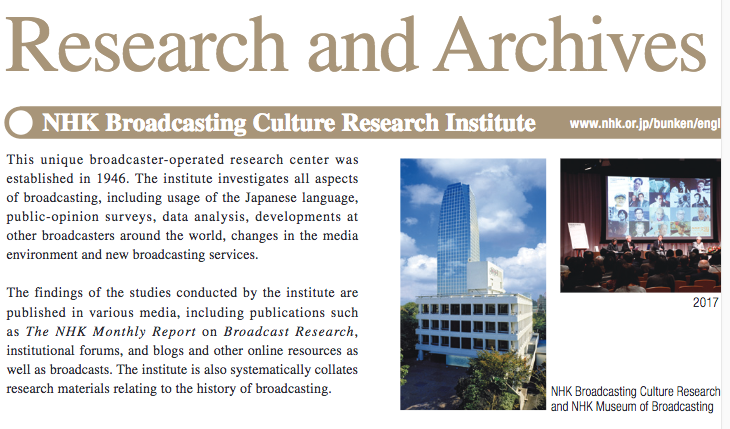 The NHK company is Japan’s top research enterprise conducting social experiments in broadcasting as can be verified HERE. NHK maintains central offices in New York and Washington, DC, and its President, Ryoichi UEDA, is heavily connected to Mitsubishi Co. whose primary institutional investor is Parametric Portfolio Associates, LLC, that is owned and controlled by major Deep State shareholders: Vanguard S&P 500 ETF (NYSE:VOO) , Apple, Inc. (NASDAQ:AAPL) , BlackRock’s iShares Core S&P 500 ETF (NYSE:IVV), Microsoft Corp. (NASDAQ:MSFT) , and Facebook, Inc. (NASDAQ:FB).
. . . .We watched the news for hours afterward seeing films of people removing sewer manhole covers Honolulu and lifting their children down inside to shelter them from the incoming bombs and radiation. UH students running across campus trying to get to their rooms to make one last call to their parents on the mainland to say goodbye and maybe find shelter. Many people did just that. For a little while we were living WWIII here. You are a part of the fabric of these islands so I want you to know what it was really like. . . . This was surreal. For about an hour we were in WWIII and faced imminent death. Life is over when you get a message like that. “Oops, sorry” doesn’t begin to wash away what happened as a result. It’s like a branding iron was used to burn this into our souls here. January 13th, 2018, will never be forgotten. We are glad it was a false alarm but I know life has changed here for most people. In a way we were lucky, the messages didn’t come thru in real time since we are rural and reception is sketchy. So it was pretty much over before we saw them. Still, I will never forget sister coming into the house to find me after waking up to find those messages while I was preparing to go out and do yard work. She asked me to please stay together and hold each other to the end. That is what would have been if the attack were real. We would have no chance of surviving it and we know it. A simple notification of impending death. No shelters out here and we don’t think we would want to remain with everything being destroyed. It was surreal.